Happy August and back to school ! Our last part of July was busy with the second team from Pioneer Drive Baptist Church. 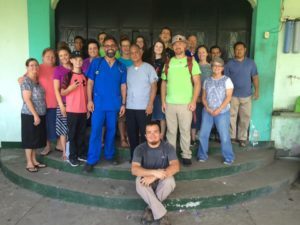 That team built 2 houses, installed stoves, visited the day care in Santa Maria De Jesus and Casa Shalom, and served at the dump ground in Esquintla. 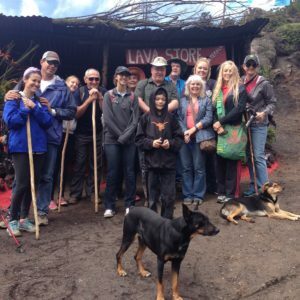 They also climbed Volcano Pacaya. It was a great time of service with that team. Thank you Wayne and Marguerite Gray for being such good servant leaders. Our next visitors were friends from our Baptist Church Builder’s group. This family is from Illinois where we built a church in Cobden in 2012. 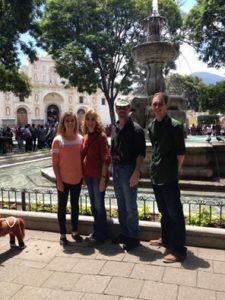 The Staley family, Patrick, Kim, Allison, and Jacob came for 9 days and stayed with us. They built a house, installed stoves, visited the day care, Casa Shalom, H.O.M.E. International Orphanage, and fixed soup at the dump ground in Esquintla. They visited the mission house so they could go back home and get together a team for their next visit. We had a team that came from McClenny, Florida. They built 2 houses, installed stoves and held a medical clinic in Rio Bravo. We have another team from Florida coming the last week of August. They will be building 5 houses and doing some other projects. Prayer requests are : safety and health for our teams, water projects to be completed, continued health for us, that God would be glorified in every act of ministry.